Vilnius is the capital of Lithuania, one of the Baltic countries. It is a city of a little over half a million inhabitants and is the economic and financial hub of Lithuania, where 15% percent of the population produce about 35% of the country’s GDP. Since breaking out of the Soviet Union in 1991, Vilnius has transformed itself from a dreary and grey communist city into a vibrant, green and beautiful cosmopolitan city. Today, a large part of the economy of Vilnius revolves around tourism, with the Germans and the Polish the two biggest groups of visitors. I have only been one time to Vilnius, but I plan to return in the not too distant future. I visited for a four day weekend in May 2016. I came there with no plans, no knowledge of the city. Flights were cheap and I had never been to Lithuania before. My New Year’s Resolution every year is to visit a new country. Those were my reasons for going. It is a decision I do not regret. I found Vilnius to be an wonderful city. It has interesting architecture, plenty of history, cozy cafes and great pubs. I met both nice and interesting people, tried a hot it balloon for the first time in my life. Had some good beer. And lets not forget the price level. Vilnius is one of the cheapest capital cities in Europe. A visit here will hardly put a dent in your pocket. 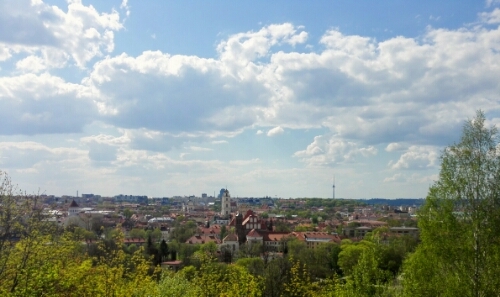 Vilnius is a charming city, a city colored green by its many parks. A city of old buildings and architecture, winding cobbled streets, nice cafés by the side of the road, and an artistic, quirky flavour to it. It is a city filled with history, much of it still to be seen today. Once a Polish city, two world wars and a cold one saw it become the capital of Lithuania, with an almost non-existing Polish population. After the fall of the iron curtain, Lithuania looked to the west, and is today a part of the European Union and the Euro zone (Since Jauary 1, 2015). This makes it very easy for most Europeans to visit. I found Lithuanians to be very friendly, always ready to help or to have a conversation. I met many nice and interesting people on my trip, people who helped make my trip as good as it was. Whether it was a stranger on the street, someone in a bar, or my airbnb host, the people of Vilnius always had a smile for you, and were ready for a chat. It is also a relatively safe city, though some caution should of course be observed. Vilnius is also a bit off the tourist trail. Yet. I expect more and more people discover Lithuania and Vilnius in the future, and that tourism will rise considerably. The majority of tourists visiting Lithuania is still from old Soviet Republics, but with its EU membership, highly popular in Lithuania, giving Schengen citizens visa free entry, more and more tourists are coming from EU countries. This should be reason enough to visit in the near future. The influx of tourists always seems to gentrify a place, killing some of the local spirit. Once charming cities become tourist theme-parks. On my way home from Vilnius I had a layover in Tallinn, where I found this process to have come a lot further. The city seemed to cater a lot more to tourists, some of its original charm was gone, and prices were a lot higher. Vilnius, I found, was still not quite there. Vilnius is a cheap city, with prices considerably lower than in Western Europe and slightly lower than in many eastern European countries. I rented a huge room in an apartment building not far from the old time, found it through airbnb, and paid less than €40 for four nights. A meal and drinks at restaurants could be less than what we pay for a beer in Norway. A four day trip did not cost me much, I could easily afford going to Amsterdam a week later, where it was considerably more expensive. When visiting Vilnius I highly recommend taking a hot air balloon ride over either the city or the countryside around Vilnius. The view is beautiful and it shows you the city from another point of view. When I visited I took a balloon ride over Trakai. The city of Vilnius is perfect for walking. Most sights are close together, and the city has many surprises in stall for you. A beautiful park, a hidden-away-store, a cozy café or bar. The Old City is famous for its beautiful, winding streets and pictureesque houses. 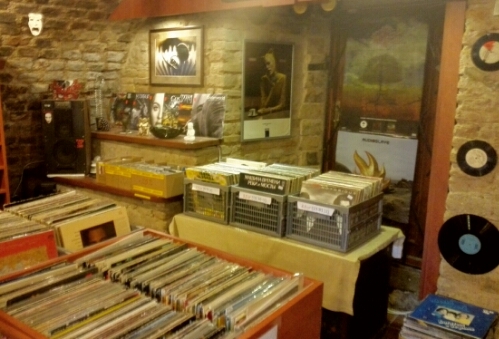 A popular place to visit is the Gate of Dawn, a sight I did not find interesting, but I came across a small music store nearby, where the owner helped me find some good Lithuanian rock on vinyl. In the city center you find the cathedral, and just behind it Gediminas’ Castle, the remnants of the castle built by King Gediminas, the founder of the city. On a hill across the river from the castle stand the Three Crosses, three glittering white crosses overlooking the city, now a symbol of Vilnius. Both the castle and the Three Crosses offer nice views of the city and its rooftops. You can also explore the castle ruins and visit a museum in the castle tower. 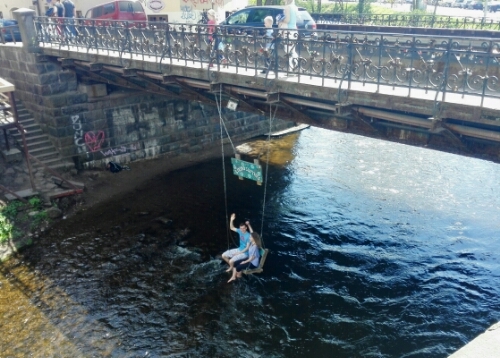 Vilnius is named after the river Vilna, which runs through the city. On one side lies the Old Town, on the other side lies Uzupis, which literally means the other side of the river. Today Uzupis is an artistic and bohemian neighbourhood, and also a self-proclaimed republic. This little neighbourhood has an interesting recent history. I found many good restaurants in Vilnius, some serving traditional Lithuanian foods, others with a more international meny. The cit has a wide choice of places to eat at, and with the price level as low as it is, going to a fancy restaurant is much more affordable. On my first day I discovered Prie Katedros, a brewery restaurant serving good food and local beer. 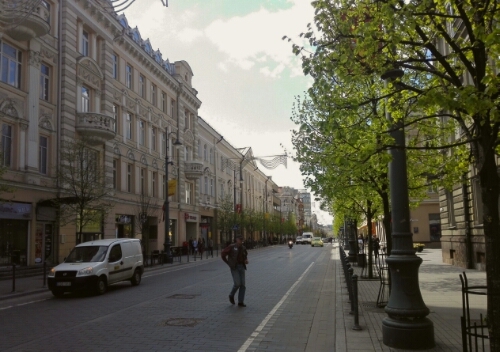 It is located in central Vilnius, on Gedimino Prospektas, one of the main shopping streets in the city. On a sunny day it is a perfect place to sit outside, enjoy a cold beer and observe all the people walking by. 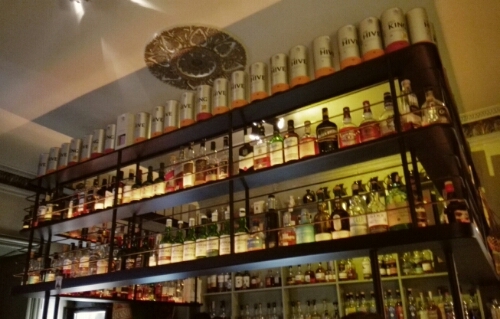 King & Mouse is a well-stocked whisky bar not far from the Old Town. Here you can try whisky from all around the world, and if you find one you especially like, purchase it from their bottle shop next door. During my visit Vilnius celebrated Europe Day, a celebration of the European Union, which is still very popular in the Baltic countries. A whole street was closed for traffic, and food trucks were serving delicious food from all over Europe. 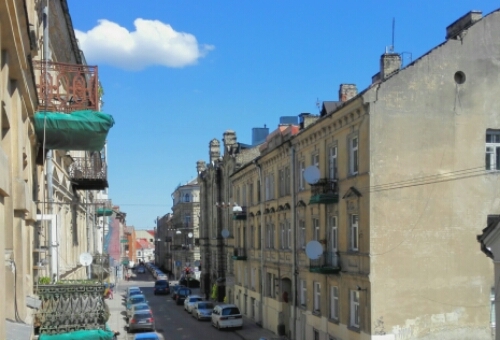 I rented a room through airbnb.com during my stay, and got a very cheap room in the apartment of a very nice Lithuanian family. Renting tough Airbnb gives me a more local feeling to my accomodations, and my hosts were very helpful in showing me their city. On my last night in the city, on my way home for the night, I met a group of Japanese, got a chance to practise my Japanese language, and got a lesson in Japanese hospitality and politeness. Wikitravel. A great resource to everything travel related. Here their page about Vilnius. Wikipedia‘s page about the city. 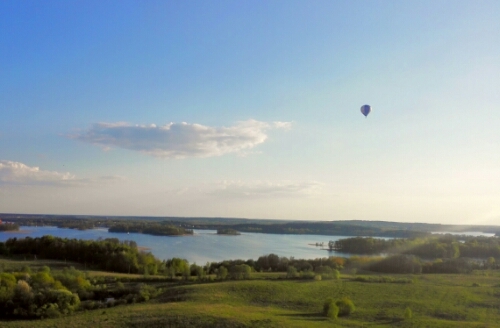 A Hot Air Balloon Ride over Trakai, Lithuania. While visiting Vilnius I flew with a hot air balloon for the first time of my life. It was an exhilarating experience. Europe Day. A Street Food festival celebrating the European Union and its diverse food. A Music Store at the Gate of Dawn. The Gate of Dawn is one of the more popular sights in Vilnius. Personally I liked the music store just down the street a lot better. Prie Katedros Brewery Restaurant. I love trying the local brew, and when I walked by this bewery restaurant on my first day in the city I knew I had to visit. King & Mouse Whisky Bar. A lovely whisky bar with an impressive menu. There is also a whisky store next door if you wish to bring a bottle home. The Three Crosses. Perched on top of a hill, overlooking the city, these three crosses have become a symbol of Vilnius. Uzupis Republic. 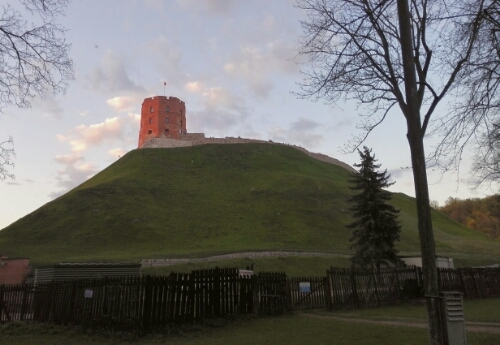 Did you know that there is a self-proclaimed republic in the middle of Vilnius? Read more about Uzupis and its declaration of independence. Gediminas’ Castle. Now mostly a ruin, this castle was originally built by King Gediminas, the founder of the city. Practising my Japanese. Meeting a group of Japanese students on my last night in the city gave me an opportunity to practise my Japanese. A Layover in Tallinn. On my way home from Vilnius I had a long enough layover in Tallinn to visit the city.